Monday saw me travel to Manchester to give a little talk at PrintCity, based at MMU. It's been a while since I took the early morning train to the city I worked in for twelve years and I have to say it's not improved one bit — it's still bloody awful and something I really don't miss having to do anymore. The students were great, asking great questions, and was wonderful to hear the things that interest them, especially as the course they were part of at PrintCity sees students coming from all different courses — from textiles, to engineering to product design and more. Following the talk I joined Ed, Pete (who used to code games for the ZX Spectrum) and Craig who run PrintCity to record a podcast which you can listen to via iTunes. On the way back, as I was stood on the platform waiting for the train home, I had a DM via Twitter asking if I fancy giving a talk in the USA, spurred on by my Trend Micro work. Of course I said yes, so plans are now in full effect to arrange flights. The rest of the week was getting back to this title sequence work, which also saw me having an Instagram video call with Manuel in California who is creating the soundtrack. Whilst I was part way through loading the dishwasher we discussed the direction the music needs to take after the first iteration. It's always much easier to discuss these things on a call rather than comments in an email. With email or Slack you can easily loose nuance and things can come across not how you intended. Plus I hate Slack so the chance of me using that hateful noise amplifier is next to nil. With this title sequence I've been going back and too trying to refine the look, playing with lighting, trying to reach a balance between quality and render time. I'm still learning so much with my adventures in Houdini. On Thursday I had a call with a friend in New York about an exciting new, experimental project that I have to say I'm really excited about. I can't say what it is just yet, but it sees me creating this thing in Touch Designer, something I've wanted to use for some time but never found the right project till now. 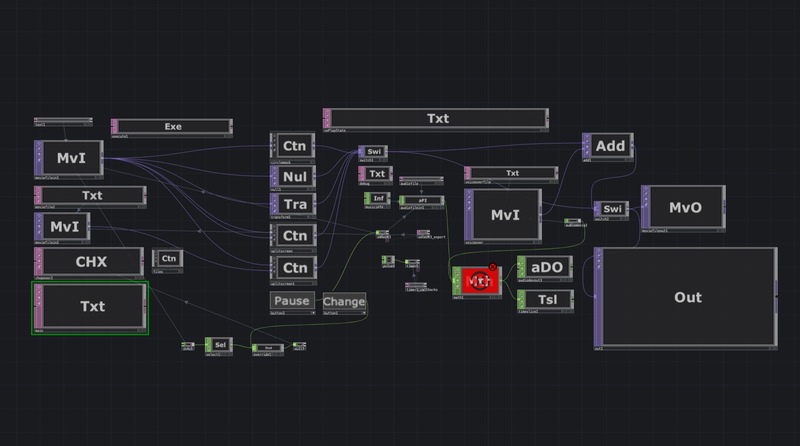 I forgot how much fun using a node based system like Touch Designer was and it's weird how my latest pieces of work have both involved a node based workflow. I'm not talking about Node.js but the procedural workflow of graphical nodes wired together, something that Houdini also uses. Many years ago I was really into Max/MSP which used a similar system. I find it a powerful way to work that is very akin to a sketch-like creative process. In the course of digging into Touch Designer I've been having to learn more Python related things and its weird (to me) tab based syntax.